We all know that fiscal this and budgetary that are tight, goodness our respective (though not respectable) governments around the world tell us that everyday even though we don’t need telling because the evidence is in our pocketbooks already. But in France things seem to have got much worse all of a sudden. 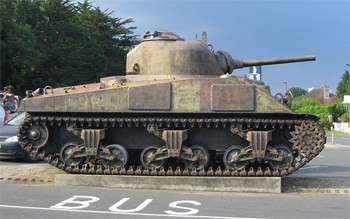 The picture below shows the latest form or public transportation being pressed into service now that the French can’t afford to replace their ageing buses, a second world war tank. Goodness knows exactly what they will use instead of the Paris Metro, stay tuned in and I will let you know as soon as I find out! I have to say that the speculation is delicious and my money is on Elephants.